SPECTRUM FITNESS: COMMIT TO GETTING THE MOST OUT OF LIFE. WHEN IT COMES TO WORKING OUT, WHICH ENVIRONMENT IS BEST FOR YOU? CUSTOMIZED TRAINING OR GROUP EXERCISE? PERSONALITY: Do you need motivation? If you are one that needs accountability, a more personalized approach, or if you are even working through specific joint and muscle pain, our small group training can meet you where you are. We individually plan, we specifically program, and we expertly provide the tools you need to see change. With years of experience, up-to-date research based training, being influenced by both the strength/conditioning and physical therapy worlds, we can tailor your program to fit both your wants and needs. SCHEDULE: You need to find time for yourself! Spectrum offers over twelve hours of training a day, five days a week. “I don’t have time,” is an excuse of the past because we have made time for you! TO SCHEDULE A FREE CUSTOMIZED SESSION CLICK HERE, AND PROVIDE US WITH THE PROGRAM YOU ARE INTERESTED IN. PERSONALITY: If you like working out in a group setting, classes are a great option for you. Motivation, competition and accountability are all potential benefiting factors of working out with a group. Having others working out along side you can help to motivate you and make you push yourself harder. It is a good way to challenge yourself without being in a direct competition. Working out in a group allows you to see the pace others are moving which can drive you to hit a level that you didn’t know you were capable of. Being competitive throughout some workouts or part of a workout, can make getting in shape fun and enjoyable. SCHEDULE: Most people don’t have hours to spend at the gym; they have jobs, families, and other priorities that are just as important. Going to the gym for an hour, getting your heart rate up, getting a good sweat in and having someone tell you exactly what to do is mindless and quick. Spectrum offers quick and mentally low maintenance workouts and class times for all clients. Depending on personal preference, we have classes for the early bird before work and multiple times in the evening after work. FEEL FREE TO DROP INTO ANY CLASS, ANY TIME. *RAPTOR: A challenging, but fun built in resisted harness used to improve strength and speed. These exercises will be used to get your heart rate up and include lower body, upper body and core movements. To really understand the fun of the raptor class come and see what it entails! BOOTCAMP: A combination of strength, cardio, and muscle endurance based training techniques that will keep your mind as engaged as your body. An endless variety of workout combinations keeps this class entertaining day after day. 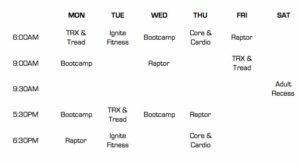 IGNITE FITNESS: Experience blood pumping and calorie burning in this high intensity class with a mix of diverse exercises used in quick burst with a brief recovery time. CORE & CARDIO: A blend of core based exercises- targeting the abdominals, glutes and lower back- paired with intense bursts of movements to help improve stamina and endurance. ADULT RECESS: Channel your inner child with a total body, action packed class that includes, but isn’t limited to, games, competitions, and fun had by all! TRX & TREAD: Engage all your muscles with a TRX strength based workout, which allows you to work against your own body weight, paired with high intensity exercises to get your heart pumping. *This is a Seasonal Class, and will change every quarter. Please provide us some information and we will get in touch with you very soon. Thanks for your interest in SPECTRUM.